There’s no curly girl or any woman for that matter, that doesn’t like to showcase their curls or a perfectly achieved hairstyle. To reach this level of awesomeness and what would certainly be a glorious day-slash-week it’s very important to choose the right products or have the right product combination or one can end up with frizzy curly hair. Any curly girl knows this, right?! To avoid the frizz that always seems to be lurking around it’s critical to have some understanding of humectants. When it comes to the primary goal of a curly girl, anyone will tell you it is to keep hair moisture. There’s actually no surprise here since the shape of curly hair determines that our hair is naturally dry. The shape of our affects the way the lipid protective barrier of the hair protects it and how the cuticle layers of the hair lie which ultimately determines our hair’s ability to retain moisture. Sebum is a waxy substance secreted by the hair’s sebaceous glands, it protects the hair not only against external damage but it prevents the hair from losing moisture quickly. However, because of the shape of curly hair sebum is unable to completely cover its whole length which causes loss of moisture and vulnerability to external damage. Additionally, the cuticles of the hair which are arranged in a scale-like manner on the surface of the hair can’t perform their function successfully because of all the loops and twists of curly hair. Instead of resting flat to help retain moisture inside, where a loop occurs the cuticles remain ‘open’ and let moisture escape. Essentially, this means that the shape of curly hair directly influences its ability to stay moisturised. It means it is naturally dry and more prone to damage (brittleness, split ends, hair breakage) than straight hair. Talk about drama in your life, right?! But this is not all if you factor in hair porosity, the environment (the sun, wind, sea water, low and high temperature, pool water, water quality), heat styling tools, manipulation or chemical treatments the risk of hair damage is even more alarming which makes it even more important to have products capable of moisturising the hair and retaining that moisture in. Humectants are ingredients capable of attracting water from their surroundings and hold on to it keeping the environment they’re in moist or moisturised. Hair care (and beauty) companies will use humectants in a product formulation because of this same ability. Ingredients in this group will absorb water into them and hold it inside the hair keeping it moisturised for a longer period of time. The great thing about humectants is that they can not only draw water from the products they’re in and when washing the hair, but they can also draw water from the air helping to keep the hair moisturised. However, the same quality that makes them for hair product formulations is also the reason why many curly girls stay away from it. 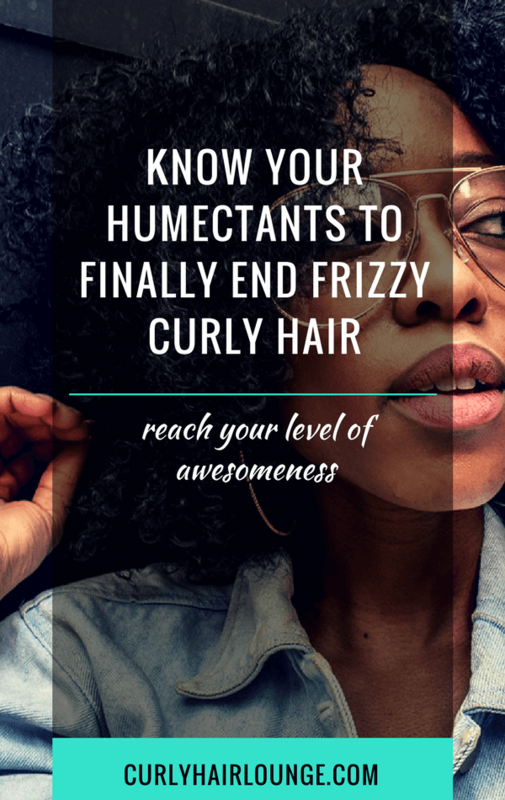 Yes, humectants have a naughty or an evil side some would say and that is due to the fact that if the humidity level in the air is too high or low humectants will create havoc in your hair. Simply put, with too much water content in the air humectants will draw too much water into the hair (’cause that’s what they do) making it swell which will raise the cuticle layers and make the hair frizzy, soft and even sticky. On the other hand, a low water content in the air (dry air) makes humectants take moisture away from the hair to the environment which will result in rough, dry hair. In essence, this relationship between temperature and water content in the air refers to the Dew Point, which according to the Collins Dictionary is the temperature at which water vapour in the air becomes saturated and water droplets begin to form. Though it sounds like I’m laying the foundation of a Greek Tragedy, it is possible to know the Dew Point. To save you from all the ‘sciency‘ information let me just say it involves some boring calculations and luckily for you, I’m just gonna drop a link >> here<< where you can find out what is your dew point. Between 50 ºF/12 ºC and 64 ºF/17 ºC – dry and comfortable to those on the lower edge but at above 60 ºF/15 ºC humidity is perceived. Greater than or equal to 65 ºF/18 ºC – lots of moisture in the air which starts out by being somewhat uncomfortable but has the temperature continues to rise it will become increasingly uncomfortable and alarming. Are you still with me, no panic attack?! Great! Now that we averted two crisis let’s discuss what humectant you can find in your products and how they differ. While glycerin is perhaps the best-known humectant alongside panthenol and honey (high five to all the DIY sisters! 😉 ) there are many other humectants in the product formulation field. Some are composed of small molecules like glycerin and then there are different compounds that can also act as humectants such as hydrolysed proteins. In trying to understanding how humectants work on the hair it’s important to know that while glycerin is highly demonised and avoided among many curlies for its ability to completely ruin a good hairstyle in high and low humidity conditions in the air, the reality is all humectants have this characteristic. Just as moisturiser X is better at its job than moisturiser Y so are humectants. You can kinda see them in a spectrum where some humectants are really powerful at binding with water and others are mild. Because glycerin is so good (and cheap to buy) at keeping the hair and skin moisturised you will often find it in product formulas. Examples of some of the more powerful humectants you can find in your products are Glycerin, Propylene Glycol, Sodium PCA, Sodium Lactate. Now you know this it may be a good idea to avoid these humectants when the humidity levels in the air are low or high, instead go for Sorbitol, Panthenol or Hydrolysed Silk Protein. However, the place where your humectant is placed in the ingredients list may also weaken its effectiveness/power. If it is placed within the first five ingredients it has a bigger impact on the hair than if it’s placed somewhere in the middle or even at the bottom. Additionally, a milder humectant may be used in conjunction with a stronger one in the formula to create some sort of balance. Well formulated products will have humectants to attract and hold water inside the hair and emollients to lock/seal in the moisture and delay moisture release. Making sure your product has a good balance of vegetable oils and butters will not only do this but it will also create a barrier that will prevent humectants from binding to more available water, therefore, helping you avoiding frizzy curly hair or very dry hair. Another solution people have readily embraced when it comes to humectant is to avoid all products that have glycerin in the formula in order to avoid all possible outcomes (some are now advertised as being glycerin free). However, avoiding them may not be the best solution as they are very good at keeping curly hair moisturised and well-formulated products will have them. Instead, you can use a hair journal and record your product use and outcome to discover what works best for you (you can use a notebook or this hair journal I created). Lastly, a silicone based oil would solve the whole issue, but we all know how controversial they are among curlies as well… they would create a light but effective film, but in the in the impossibility to use them and knowing how to use them (yes, they can be tricky for curly hair, know more here) you can use a broccoli oil which has been known to mimic the effects of silicone. Dope, right?! I like to buy my natural ingredients from Sheabutter Cottage and if you’re interested you can buy from them here. (Psst… it’s just to let you know that if you buy from this link I get a really huge commission and become filthy rich. Well, more like £0.45 or so richer. 😀 ). How have humectants affected your use or purchase of hair products? By “humectants” you mean a specific product, like a hair mist or are you referring to all products that can moisturize in one way or another like shampoo, conditioner, butter, etc?